Megan joined our practice in 2009 as a high school co-op student. 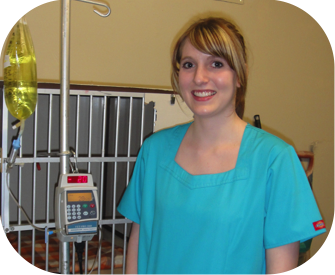 She graduated from Quinte Secondary School in Belleville, Ontario in 2010 and is currently in her 3rd year at the Ontario Veterinary College where she is working toward degree in Veterinary medicine. We are fortunate to have her compassionate and kind manner assisting in patient care. When not working or studying, Megan enjoys reading, photography and outdoor activities such as riding her ATV. She also has lots of animals to keep her busy and help hone her veterinary skills including 3 German Shepherds and 2 cats!